Deciding to become a company director is a step that should be considered carefully before taking on the role and responsibilities. Under Irish company law, a director’s duties and the scope of what a director needs to know have increased enormously. In addition, the public now have much higher expectations of the standards of behaviour of directors serving on boards. 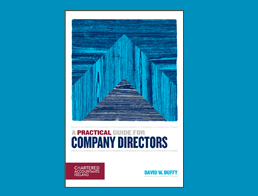 A Practical Guide for Company Directors by David W. Duffy is published by Chartered Accountants Ireland and retails at €40.00. It is available in all good book shops nationwide and from Chartered Accountants Ireland online shop here.